Ektoplazm is happy to present a new album by Swiss musician SubConsciousMind. 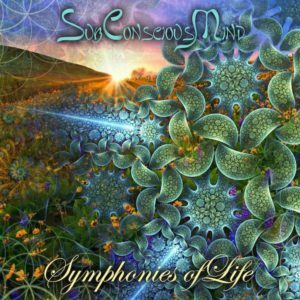 Symphonies of Life, his fifth full-length release, explores different aspects of the human experience: Patience, Truth, Consciousness, Destruction, Love, Creation, Beauty, Humility, and Trust. This is an album that reveals its true intensity the more you listen to it. Every time you hear it another theme might resonate with your inner world, or new revelations may come to pass. One day a theme may not get through to you, another day it will open up an emotional world without description. Keep this in your playlist, let it be part of your life, and the beauty of this musical artwork will unfold over time. Here we have an album that truly says what can not be said with words, music that tells stories for real! All songs written & produced by R. Huber @ SCM Soundlabs (2010-2018), mostly using solar power. Mastered by Vince Le Barde. Cover design by R. Huber. Subscribe to the SubConsciousMind Newsletter to stay updated about new releases and please consider supporting the IndiGoGo Campaign for the album or SubConsciousMind on Patreon. MP3 Download | FLAC Download | WAV Download · Download count: 30,675. Amazing piece of work !! This is the first and only interesting and non-boring full-on album released in the last 20 years. Cool stuff! Beatiful music bro! Thank you very much! Beautiful! Your music is ART. wow this is impressive stuff!! I’ve always been a fan of SubConsciousMind! This is another piece of art! Thank you! Love it, very good release! Sometimes after a while getting older you just want things to be kind to your ear, this is kind to my ear. honestly it’s the first time after 2,5 years that i play the studio convertors full volume, i suppose that should mean smth..
Infinite thanks for your work. Very nice!. Carefully composed and arranged, a masterwork of music and technique! Great album, I’m a fan! This is a pearl! I like the deepness, that come from this a master amazing piece of psychedelic music, It’s really not often I download, and even when I do, only few albums and artists I will keep in my sound library. But when I do, It’s like reading again and again amazing books, I repeat listening for years, and this album that i listen for the first time now is definitely one of those!! Thanks and Namaste to Subconsciousmind for being the vector of this conscious creativity and sharing it for free!! I’m really appreciating the experience! AUM! Album extraordinaire très bien équilibré. Du travail propre, un son carré, rien à dire. Great album, emotional and psychdelic, i liked, true art ! Read everyone’s comments and was expecting some super heat…don’t get me wrong, there are definitely some nice tracks on here, but it’s not mind blowing. Pure audio emotion. This is heart felt musiiiiiiiic! I mixed your album and it’s awesome ! Thanks for this work !